The travel scene is one of interest and intrigue. You meet new people, see new sights, and hopefully broaden your horizons in ways unimagined. It’s all good…except for the logistics of moving from spot to spot. Border crossings, visa issues, and transportation options can weave into a tangle of indecipherable information in your head. Yet, in places like Europe, where all of the countries lie so close together, it’s so easy to hop from spot to spot. Likewise in Central America, with the added benefit of low prices. A little over $20 will get you a cross-country bus ticket from Costa Rica to Nicaragua. Another $50 will get you from there to Guatemala. That’s not even the price of a having a piece of luggage on some domestic airlines. So why not hitch a ride on the bus or train and see more of the local sights? Besides, I’m a big fan of just hopping on a bus and ending up somewhere. Sure, you could plan ahead, but that flies in the face of the whole carpe diem lifestyle when you’re on the road. The first thing to do, then, is to seek out other travelers from your home country and ask them lots of questions. They may know where to get a visa, what the visa regulations are, how to manage longer stays in some countries. They can even tell you spots to avoid or what to do on tricky border crossings. Sometimes guidebooks can offer assistance, but other times they provide information that’s not quite so practical. For instance, one travel book suggested traveling from Costa Rica to Nicaragua on local buses. The idea is to save money doing it. So you buy a ticket on a local Costa Rican bus to the Nicaraguan border, go through immigrations without having to wait hours for other travelers on your bus to finish, and you walk across the border to the other side, where you again go through immigrations and then catch a local Nicaraguan bus to wherever you plan to go. Sounds easy enough. If you speak the language fluently, if you know what the costs of exiting and entering the different countries are, and if you know how to spot an official police or immigration uniform, you'll do fine. If not, you may have problems. Stories abound of travelers trying to find the cheapest way to cross, but ending up having their luggage stolen or paying a random stranger money to cross because he looked like someone who worked in the immigrations office. This is where a bus service like TicaBus or TransNica comes in handy. They handle all of the paperwork; they tell you what you are supposed to do and how much to pay, and what to do on the other side. And how do you find out where to find the stations and which routes or times are the best ones to book? From locals or from other travelers on the road who just passed that way. Fantastic. Your travels just got easier. 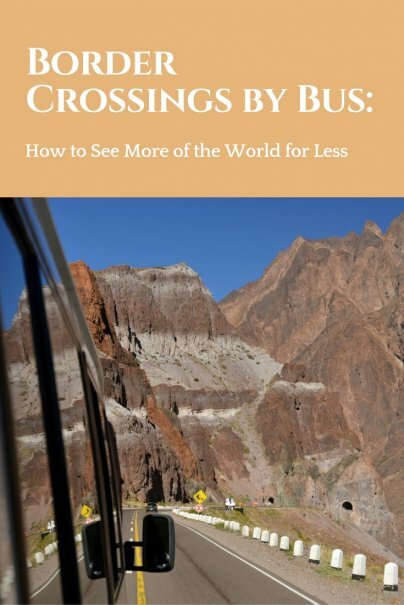 If you have loftier travel goals and want to roll on through a few countries by bus to reach a final destination, you have a lot more logistics to handle. Most borders have entry and/or exit fees, and visa regulations differ depending on where you are and where you’re from. In Central America, it’s not too tough for a U.S. citizen to get through because the visa limitations are pretty minor. Most places let you stay for 90 days on a free tourist visa. In Costa Rica, you come in on a free 90 day tourist visa, as long as you have proof that you have a ticket out of the country. If you arrive in Nicaragua by bus, you also have 90 days to play. You can re-up your visa at a local immigration office. Twenty five dollars will get you an additional 30 days. If you don’t leave on time, you’ll be subject to a fine on your way out. Other parts of the world require at least a little bit of planning, although you can easily find information on what to do when you hit the ground. For instance, getting a visa to China can take a week or so or you can get an express visa processed overnight in Hong Kong — for a higher price. In Indonesia, you can buy one in the airport after you land. Twenty-five dollars will get you thirty days. Or you can buy one ahead of time and pay $45 for 60 days. Stay longer at your own economic peril because Indonesia fines you $22 for each day that you overstay your visa. Korea and Taiwan let U.S. citizens stay for 90 days on a tourist visa. It all depends on how you want to travel and how long you want to stay in a place. It never hurts to do a bit of pre-trip research to nail down the logistical details. It’ll make your life and your travels that much easier. And it might save you some money in the end. So go on. Grab a ride to somewhere as yet unknown. You won’t regret it. I’m a writer with an eye for a good bargain.